It may take only two hours to fly to Greenland from Iceland but it is a world of difference here. The Gulf Stream has bestowed Iceland with much greenery but Greenland, in particular, Kulusuk along the east coast, lies on 65'C 35'’, just south of the Arctic Circle, and way off the warm Gulf Stream. Granite rock, massive icebergs, bare haunting landscape with tiny pockets of greenery which in any case comprise of mainly grass and algae, and loaming inland is the Greenland Icecap, which covers more than 85% of the world’s largest island. 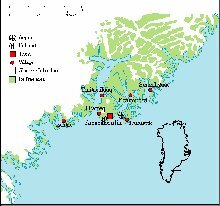 The Inuit people (previously known as the Eskimos, these days denounced as a depredatory term, for it means people who eat raw meat) were the first peoples of this island. In the 980's, Eric the Red, a Norwegian Viking who got into repeated trouble (real serious ones like murder and vandalism) in Norway and then Iceland, fled here where he founded a colony. 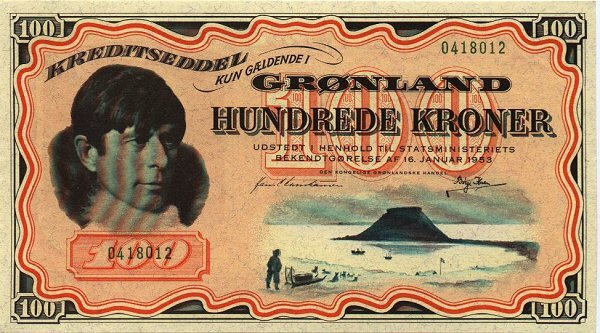 Then he committed one of the greatest frauds in the history of the world property sector by naming the island Greenland so as to attract settlers - all despite the desolate coldness and hostile environment. The colony grew and then died suddenly by the 1400's, still a mystery to historians. 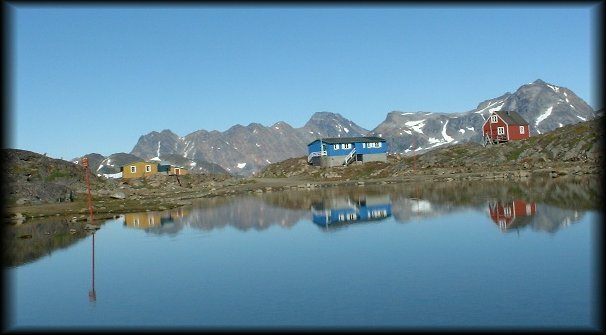 In 1721, the Danish re-established European settlement on the west coast of Greenland, mainly as a trading colony. 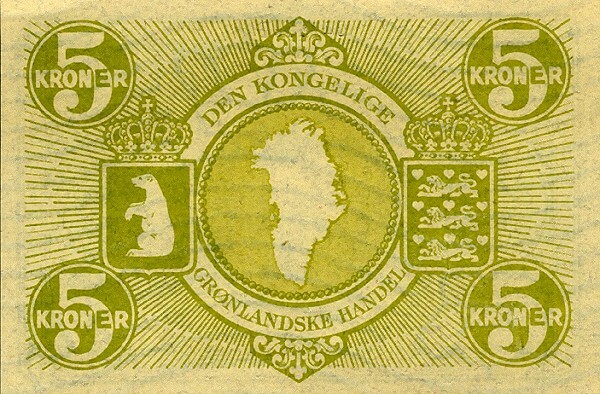 They ruled for the next 200 years or so, until 1979, when Greenland was declared an autonomous nation within the Kingdom of Denmark, named Kalaallit Nunaat (meaning Land of the People), with its own national flag and Prime Minister. 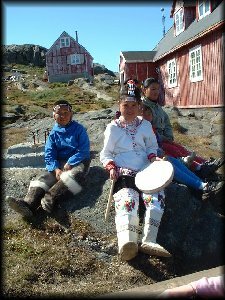 20+ years on, Greenlandic, or East Inuit language, has become the first language, and Danish the second - Greenlanders above 40 years old tend to speak Danish better. The Civil Service is largely Greenlandic as well and I see more Inuit signs than Danish ones. However, like most small remote nations, economic independence is non-existence. Most of the national budget is funded by Denmark. Everything in the supermarket is Danish. 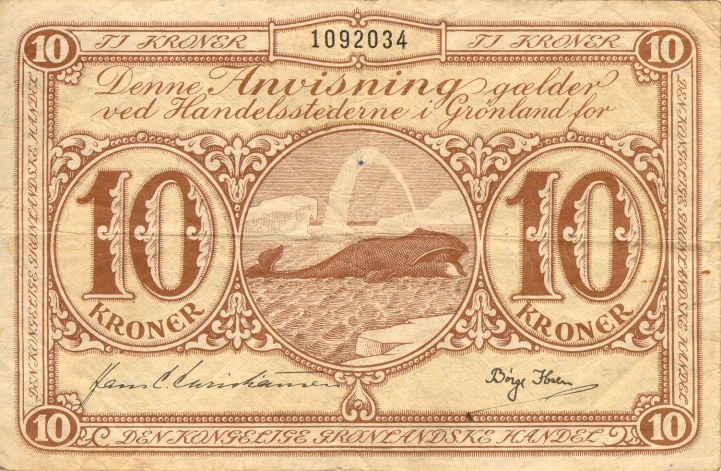 Job prospects remain poor and most services, from air transport to seal hunting, are subsidised by the Greenland Home Rule Government, which in turn, is funded by the Danish taxpayer. Kulusuk, where I flew into, is the air hub of what is known as Tunu, or “Backside” of Greenland, covering the eastern half of the country. Of the country’s 56,000 people, only 4000 live in this whole region, which is equivalent to half the size of Western Europe. This region is extremely isolated, blocked by ice for 9 months out of 12, and only supplied by three icebreakers from July to September. If you come here in May, most of the grocery stores are empty. The skin of a polar bear is hung from the walls of the airport terminal (which is nothing more than 3 average size rooms). That’s one of the two shot on the airport runway in 1994. Polar bears are dangerous creatures. They are feared as well as loved. They are man-eaters, the most powerful creatures of the realm, but they are also the embodiment of the human spirit in this harsh land. 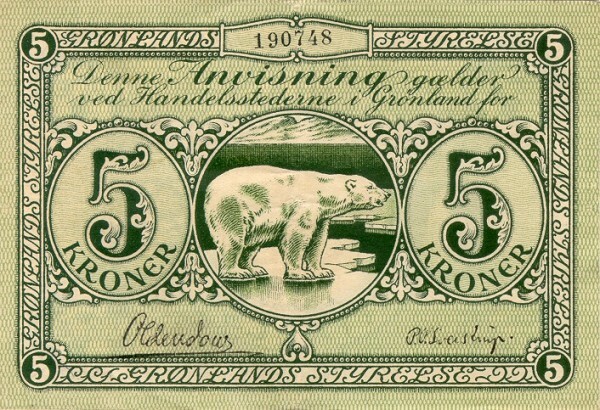 Indeed they appear everywhere here, from ancient legends to corporate logos and the national coat of arms of Greenland. I walked into the village, about 4km from the airport. Snowcapped mountains surround us, and the numerous icebergs reflect the glaring sunlight from the sea. Eagles hover around from the skies while one might sometimes hear gunshots of hunters shooting seals and whales from afar. The overall beauty and serenity is deceiving. Summer temperature may range between 0'C and 15'c, but sudden drop in temperature can happen anytime. Just look at the waters in the village harbour. The locals have corpses of hunted seals sunk into the harbour as the cold waters act as natural refrigerators. In addition, though polar bears may be rare in summer, their presence is always a possibility. Years ago, a woman was killed in a polar bear attack, but of course, the locals believe that it is the work of tupilak, or spirits out for vengeance on the command of evil-doers, or it could be that the woman herself had asked the tupilak to commit crimes, but the tupilak had turned around on her instead when it encounters a stronger tupilak guarding her enemies. Well, this region has only been converted to Christianity in the 1920's. The old gods remain powerful. This is also the land of the semi-permafrost. Tombs are shallow and the dead are often stored for months before being buried in warmer months, so that the soil can be dug. Indeed, there is no sewerage systems - toilets are nothing more than a large bucket to be emptied from time to time - and few houses have running water and electricity - the ground is too hard for modern conveniences like these. I had earlier got in touch with Michael and Mette Nielsen, a Danish couple who moved here with their three kids two years ago. They decided that they had enough of the 9 to 5 job in Denmark and want to spend their family life in a more fulfilling way, in a faraway land. In this isolated land, their kids grow up faster than those at home. I am amazed at the maturity and intelligence of their eldest son, Rasmus, who at 11 years old, speaks good English, Danish and Inuit, and is well versed in general knowledge, plus repairing the bicycle, computers and just about every practicality required of one living in remote places. The Nielsens run a travel service of sorts, rent out one of their houses, and help to arrange hikes and excursions. I was given this most enlightening instruction - walk 4.5km from the airport, past the hotel and the cemetery, and we are the first blue house on the left side when you enter the village. Vague it sounds, but somehow I got there and was warmly received. The first day was spent on an unexpected seal hunt, which I have already described separately. A wonderful experience and I went to bed amidst the symphonic howling and wailing of the village huskies - as every family keep at least a pack of 15 or more huskies for winter transport, there are definitely more dogs than humans here. I woke up early on Sunday, not surprisingly given that the sun goes up early at 2 am or so. Rasmus walked me around the island’s wild mountains and icy slopes and across fast-flowing rivers and bright green-yellow meadows with a strange algae and scattered grass patches. It’s amazing how Greenland has turned this boy into a man at so young an age. He seemed to know the island as though it was the back of his palm. We brought along a husky, just in case a polar bear appears. The husky is a strong and brave creature, which would not hesitate to pounce at a polar bear ten times its size, giving the human time to run away. We also explored ancient Inuit tombs, looking into the stony graves, mere piles of stones onto of skeletons – where one could see the eyes of death - skulls of hunters departed hundreds of years ago - stared back at us with much sadness. Children performing the Inuit drum dance for tourists: That's about all the day tourists see. We spent the evening talking about life on the island, about how the Inuits here live, about serious problems like alcoholism and suicides - the result of unemployment and seasonal depression. The latter is a common syndrome in places where winter lasts more than half the year, where there is no light at all, which causes severe depression. We spoke about the chronic homesickness of the Inuits, which meant very few are educated beyond primary school, because those who go beyond that have to move to Nuuk the capital, where they become homesick and often disrupted their studies to return home. Those who go much further have to move to Denmark, where many succumb to alcoholism and drugs in a failed accelerated transformation from small village life to modern urban civilisation. On Monday, I went to the airport, so as to catch a helicopter to Tassilaq, the regional capital and largest town (OK, call it a town, despite it having only 1400 people) on the east coast of Greenland. The heli service is run by Alpha Air and is the only regular mode of transport from Tassilaq to the outside world. However, after waiting for half an hour, it was announced that the service couldn’t run today, as Eastern Greenland’s sole air controller has fallen sick. With this, the capital of a region half the size of western Europe is now cut off from the outside world. That leaves the only method, sea transport. 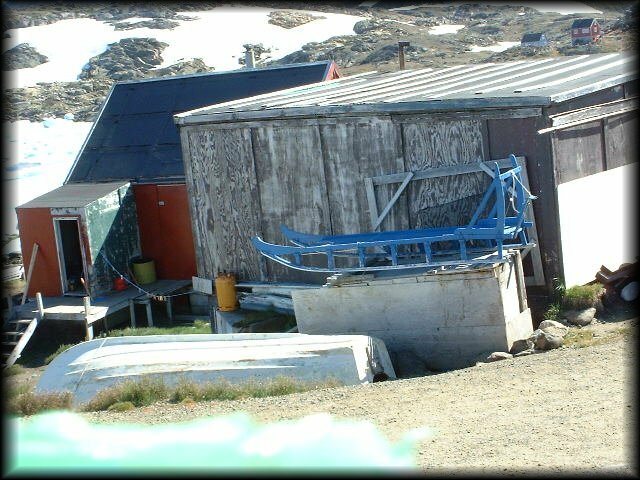 I walked back to the village, where Mette has arranged for an Inuit to sail me to Tasiilaq on his small boat - not the best mode of transport as I would have to brave the cold winds and the icebergs - I had enough of that on Saturday. Anyway, I managed to reach Tasiilaq after an hour of icebergs and strong winds. There I took two hours to see its mini museum, supermarket (where I failed to find packed seal and whale meat - well, these are caught by locals for domestic consumption, not for sale), church, philatelic bureau (one of the largest local employer) and bookshop. There isn’t much to do and I wanted to have lunch at the local hotel. Sorry, we don’t serve meals after 1 pm. No, not even for coffee. I asked the tourist office where I could sit down for a snack and tea. 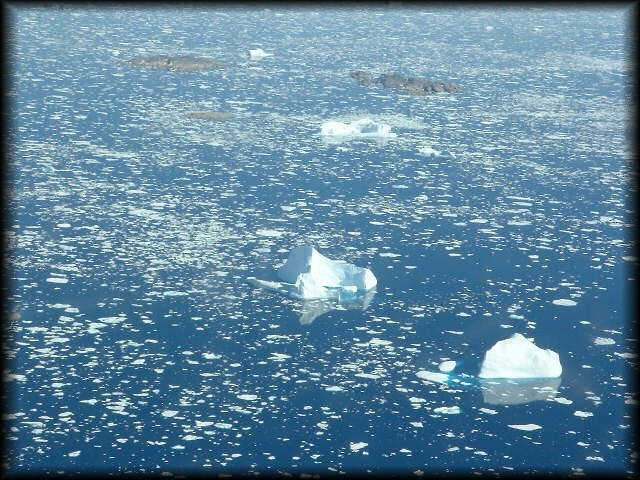 This is Greenland. No cafes available (OK, one was open, but I don’t fancy in the winds, al fresco, to have ice cream), and restaurants (only two in the whole of the east coast) don’t serve beyond 1pm. In any case, the kind lady at the tourist office has allowed me to stay at the tourist office to read my book and write my journal. At 5pm, I returned to Kulusuk on my boat and then have a nice dinner of seal meat with the Nielsens. The seal meat, given by Benti, the guy who brought me on the seal hunt, was done the Inuit way, i.e., simply boiled and salt added, tastes like beef with lots grease and fishy taste. Of course, the Nielsens have not introduced me to yet another Inuit favourite, fermented seal skin with local algae, which takes more than three months to prepare and tastes like deposits in the local toilet. Tomorrow, I shall fly to Iceland. 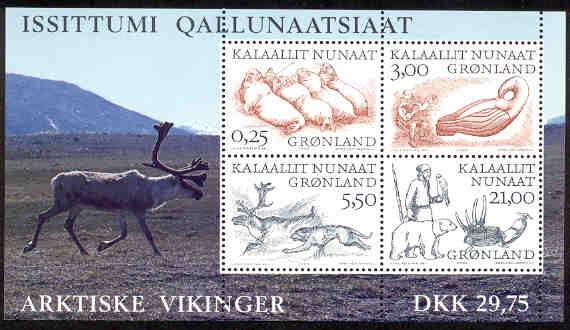 The Inuits have a word, Immaqa, which means “maybe”, similar to the Arabic Inshallah. Immaqa, it will snow tomorrow. Immaqa, the iceberges may prevent us from sailing. Immaqa, there may be no seals tomorrow. Immaqa, if the air controller of the whole of East Greenland is not sick tomorrow, I can fly out of the country. Otherwise, I am stuck here. I hope not, for I have another trip awaiting in Iceland, and despite the wonderful landscapes and friendly people, I need to have less of the strong winds and icy temperature. Immaqa.